My usual form of sustenance when I'm snowboarding consists of french fries and beers. For apres ski this weekend, we decided to step it up a bit and headed for Whitebark at the Westin in Mammoth. Yes, it's not your typical mountain happy hour spot. It's fancy, loungey and they have a snowboard/ski valet. But it's not THAT stuffy. After all, nobody frowns when you walk in with helmet hair or wet clothes. For those reasons, this isn't your typical Westin. 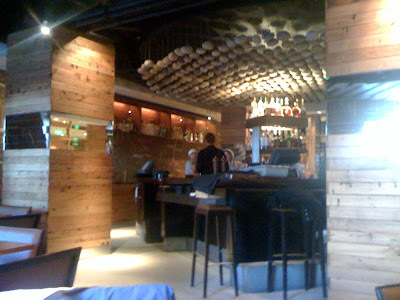 Whitebark is pretty modern and sleek with its wood decor and stones hanging from ceiling. There is a dining room and a bar area. We sat at the bar area which looked like a typical LA lounge with couches and flat screen TVs. 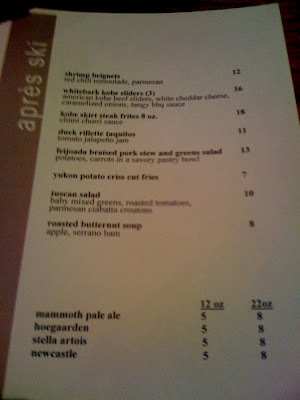 Apres ski menu includes select beers for $5 and a couple food items. It's not the most affordable happy hour menu in Mammoth but the food selection is different and more unique than what you would normally find on the mountain. We decided to order a couple plates to share between the three of us. 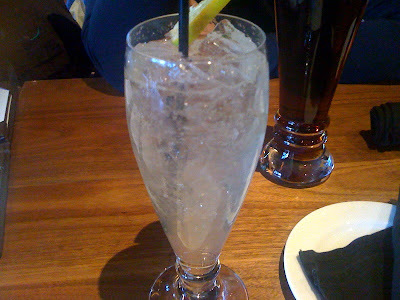 Cocktail with gin, lime and champagne. Looks like water, tastes like alcohol. I like the generous pour - so not LA. Anything with duck and deep fried wins in my books. 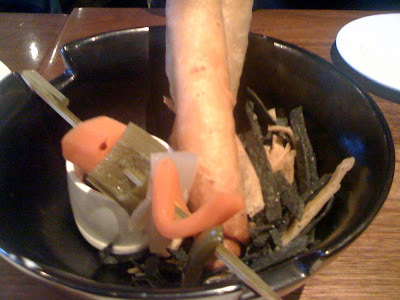 The taquito sat on top of (more) fried tortilla strips. It was tasty but somehow the duck flavor got lost in all the fried food. Delicious, deep fried poppers. 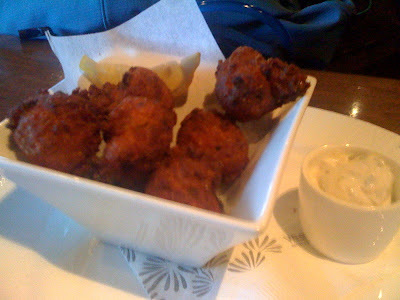 The shrimp was pureed and the beignets were airy and soft in the center. These were gone within seconds. 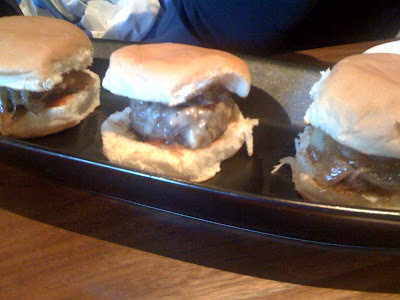 The sliders were good but they weren't anything different from what you would get at a bar in LA. Still, this was definitely something that you wouldn't find at apres ski in Mammoth. 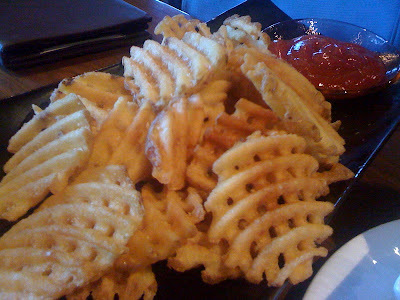 I'm not a big fan of waffle fries (I'm a skinny fries kindda girl) so this didn't win me over. It was starchy and heavy. There are days when I don't want to apres ski with the college kids at Lakanuki (another bar in Mammoth). Yes, there are days when I'd like to apres ski at the type of place that I would frequent back in LA. I liked the atmosphere at Whitebark. It's classy, sophisticated but still casual enough. Apres ski doesn't always have to equate to nachos and PBRs. Sometimes, a cocktail and kobe beef sliders will also do the trick. the shrimp donuts look awesome! I can't wait to try them when I'm next in Mammoth. Hi Yutjangsah, they were delicious and you won't want to share 'em with anyone!